Dost thou understand him as the sin-bearer, taking away transgression? Canst thou see him bleeding as the substitute for men? Dost thou accept him as such? Does thy faith put all her dependence upon what he did, upon what he is, upon what he does? Then Christ is conceived in thee, and thou mayest go thy way with all the joy that Mary knew; and I was half ready to say, with something more; for the natural conception of the Savior’s holy body was not one-tenth so meet a theme for congratulation as the spiritual conception of the holy Jesus within your heart when he shall be in you the hope of glory. My dear friend, if Christ be thine, there is no song on earth too high, too holy for thee to sing; nay, there is no song which thrills from angelic lips, no note which thrills Archangel’s tongue in which thou mayest not join. Even this day, the holiest, the happiest, the most glorious of words, and thoughts, and emotions belong to thee. Use them! God help thee to enjoy them; and his be the praise, while thine is the comfort evermore. Amen. From a sermon entitled "Mary's Song," delivered December 25, 1864. 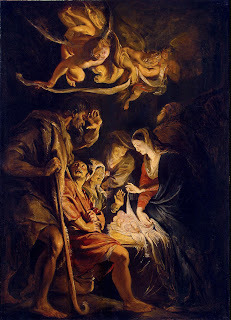 Image by Pieter Paul Rubens, "The Adoration of the Shepherds;" in the public domain.